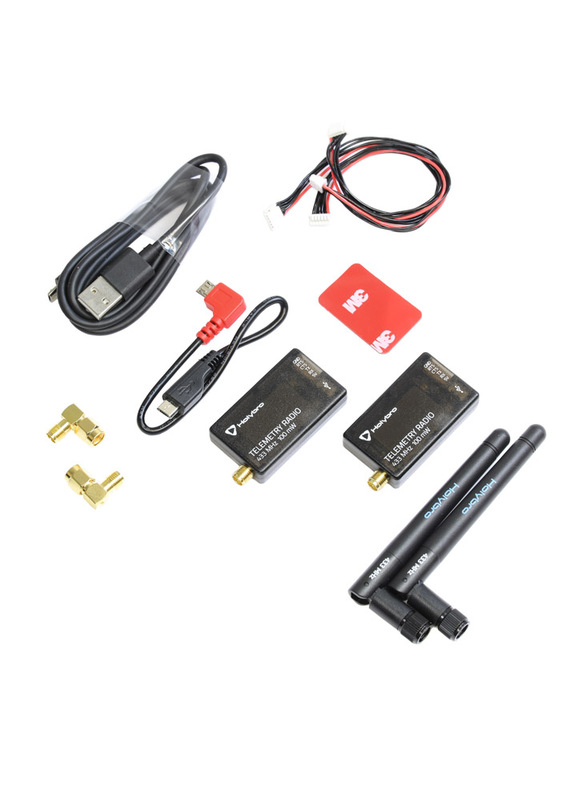 The Holybro Telemetry Radio Kit allows you to easily add a two-way telemetry connection between your autopilot and ground station wirelessly, providing unparalleled ease of use for viewing in-flight data, changing missions on the fly, and tuning. The 100mW version typically allows ranges of better than 300m “out of the box”, but can be extended to several kilometres with the use of a patch antenna on the ground. The radio uses open source firmware that has been specially designed to work well with MAVLink packets. The modules also feature a bootloader that permits radio firmware upgrades over the serial interface. The radios at interchangeable between the air and ground modules and the set comes with cables to connect with the Pixhawk 4 Flight Controller and an OTG cable for connection with a tablet. Use the provided 4 pin JST-GH connector to connect the radio to your Pixhawk4’s “Telem 1” port (“Telem 2” can also be used but the default recommendation is “Telem1”). Connecting the radio to your Windows PC is as simple as connecting the micro USB cable to your PC. The necessary drivers should be installed automatically and the radio will appear as a new “USB Serial Port” in the Windows Device Manager under Ports (COM & LPT). The Mission Planner’s COM Port selection drop-down should also contain the same new COM port.